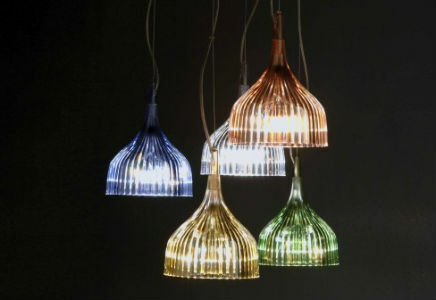 Polycarbonate diffuser and chromed metal rosette pleated in various colors: clear, pink, blue, yellow, green, white, gloss black. The rope hook on the ceiling height is adjustable from a minimum to a maximum of CM30 cm200. Lamapda Power 40W. Offered in single or multiple parts in compositions to enhance the color variations, or coordinates the wall.